Retail Products - SanDisk ImageMate USB 3.0 Reader - Peak Development Ltd. Transfer photos and video faster with the new SanDisk ImageMate All in One USB 3.0 Car Reader / Writer. Based on the latest USB 3.0 interface transfer performance of 500MB/s, this card reader / writer reduces transfer time when downloading data from card to computer. 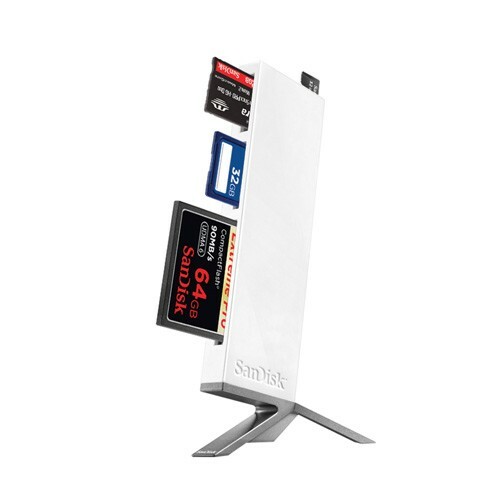 Outfitted with four card slots, this compact solution supports all major card formats and is backwards compatible with USB 2.0 enabled devices. It's sleek vertical design and small footprint makes this a great choice for stylish and fast photo and video transfer.